Map, “PLAN FOR THE ENTIRE WORKS OF ATTACK FROM THE 2ND PARALLEL”, “ Drawn by J Beardsly, Cadet Military Academy, West Point - 1841”, 22 1/2" x 27 1/2", 1841, United States Military Academy, West Point, New York. 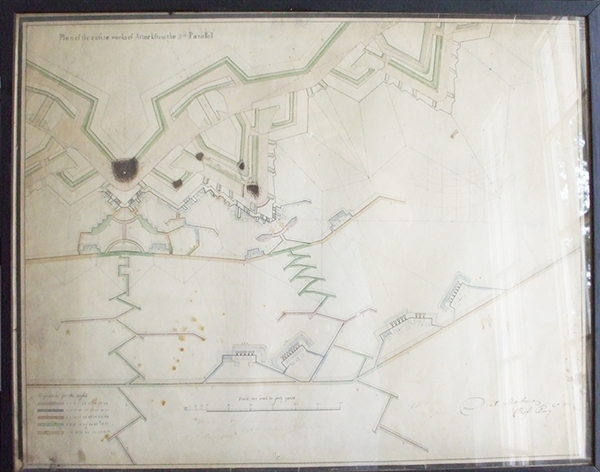 A large color-coded pen and ink map showing fortifications under siege. The cartographer, Beardsly, graduated from West Point in 1841 and served in the Mexican and Civil Wars. An inscription in the lower right corner of the map reads "Approved D.H. Mahan Prof. Eng.". Dennis Hart Mahan taught engineering at West Point from 1832 until 1871 and was a recognized expert in the field. The map, housed in a custom frame, has some soiling and a small area of paper loss in one corner. Overall VG condition.